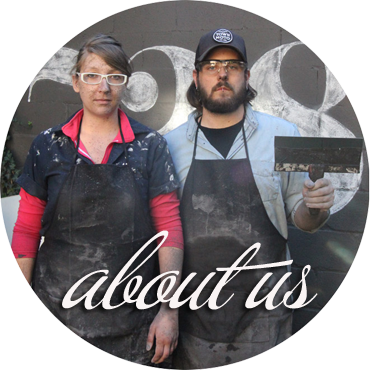 When we bought the Storefront, it had essentially been eliminated of all its character. It had been in bad shape, and the owners before us had brought it back, and modernized it, but in doing so had removed everything of the past. Don’t get me wrong, I love our spray foam insulation and skylights, but I’m not the biggest fan of the white vinyl windows and the lack of original trim & doors. 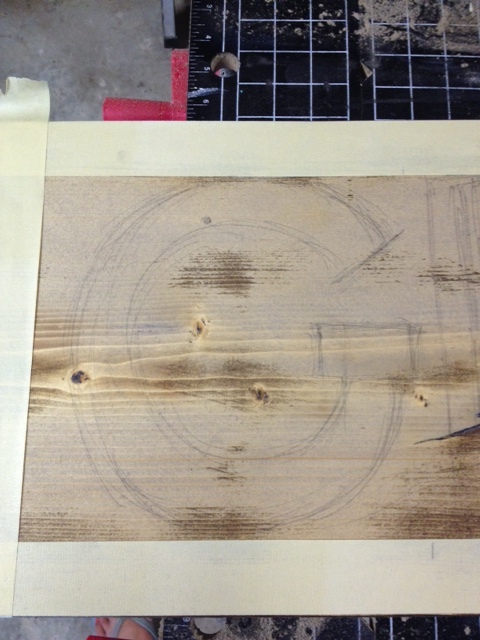 So in our quest to add some character back to the Storefront, I want to add in a bit of it’s past. When the Storefront was originally built it housed a Grocer. Later it did a stint as a Barber Shop, and until the 60’s it was a Tailor & Cleaner. I have been scouring flea markets and antique shops for anything Grocery, Barber or Tailor related and have yet to find ANYTHING awesome for the house. Barber pole? Nope. Grocery Store sign? Not a hope. I headed into the garage and found a couple spare pieces of 2×12’s that were 6 feet long. I distressed one with some stain & a blow torch, and the other I whitewashed with some watered down chalk paint. I then laid out my type. I made each letter about the size of an 8.5 x 11 sheet of paper, and just freehanded the letters with a pencil until they looked OK. I grabbed some paint, and filled in the lettering with a small foam brush, and let it dry. 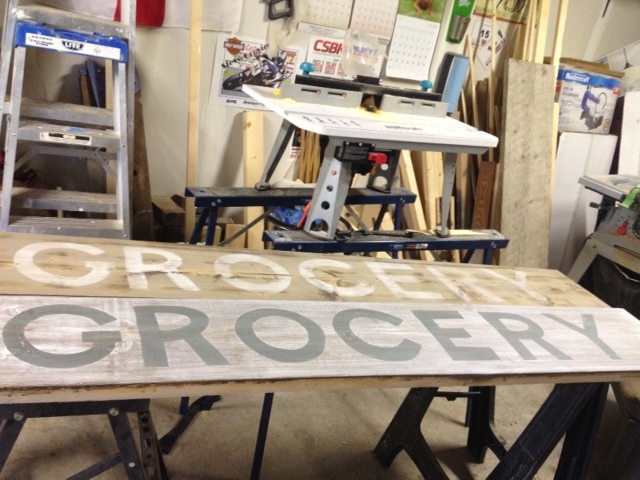 Then I sanded everything to give it a worn look, and I had two (yes TWO) grocery signs ready to go. 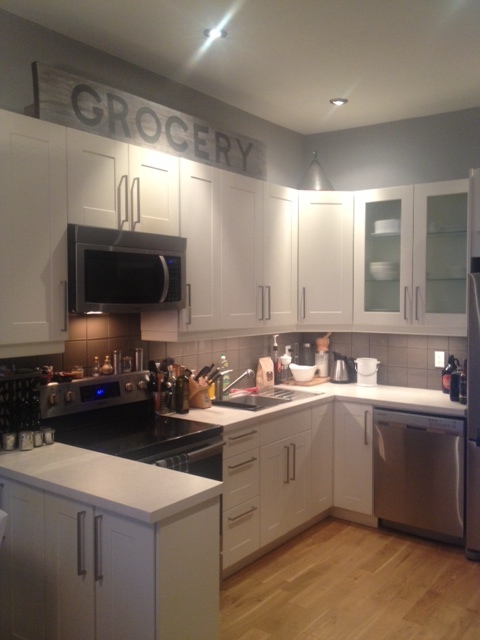 I then made El Granto put each one up on the kitchen cabinets so I could decide which one I liked best. And now the other one is still hanging out in the kitchen leaning against a wall cause I have NO IDEA WHAT TO DO WITH IT. I’m really knocking it out of the park lately. 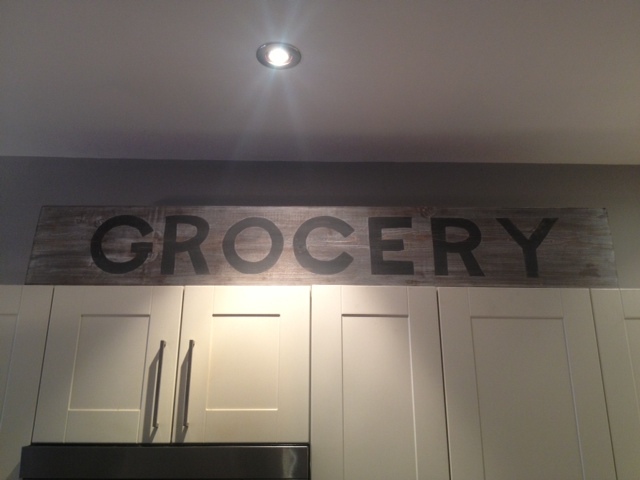 Anyone want a Grocery sign? I have been searching for a grocery sign too! I know right where I'll put it! Love your blog--I just happened upon it because of Hometalk. Such beautiful work!! !